Your roof is an important part of your house, but unless you’ve got a rooftop deck, it is generally out of sight. And when things are out of sight, they can be easily be ignored or overlooked. But considering it is one of the most crucial features of your home, it’s imperative to keep the maintenance of the roof on your radar in order to avoid any future issues with it. You would be surprised how simple maintenance tasks can help to alleviate potential problems with your roof in the future. Follow these simple steps so that you can feel confident that your roof is in tiptop shape. Any overhanging branches that may be lingering too close, or that have simply landed on your roof, must be removed. This is something that should always be performed after every winter and preferably with another person to help you stay safe on the ladder. If you prefer, you can hire a roofing contractor to clean up the debris and inspect for any other signs of trouble while on top of your home. While you’re up on that ladder, take a look at the gutters and downspouts. 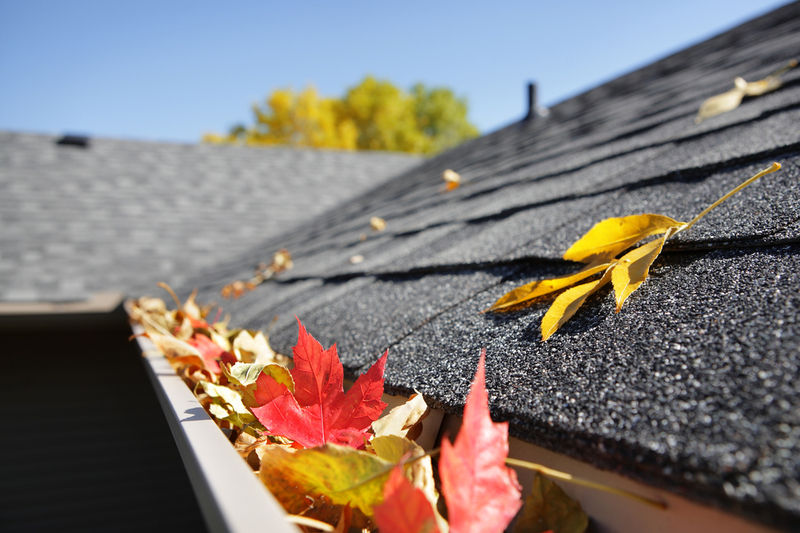 Again, after every winter, you need to make sure that any leaves that have accumulated are removed so that they don’t clog up those gutters. If debris is left, it can easily allow water to pool along your roof, which can turn into a much bigger problem over time. Any features on your roof that have separate extensions from it, such as chimneys, skylights or even vents, are more vulnerable to moisture seeping through. Perform annual checks on them. Inspect the chimney, close it off and clean it if necessary. Inspect and clean out any vents, and check around the seams of skylights to ensure that there are no cracks. As annoying as these maintenance tasks may be, they are important – especially if you do have similar extensions coming from your roof. And it could just save you from having to fork out a lot more money for future repairs if they are ignored. An overall sweep, both internally and externally is always a smart idea. Start by taking a thorough look at the inside of your home, and look for any potential signs of water damage or mold along the ceiling. Include the attic as well to ensure that water isn’t making its way into your home undetected. Then hop outside and do a general sweep over your roof to look for any signs of buckling shingles, cracks or any indications that there could be some problems festering below the surface. Don’t ignore your roof simply because it’s out of sight. Make it a priority to inspect and perform necessary maintenance on it every year. If you perform these basic maintenance tasks, you can feel pretty confident that your roof won’t spring any costly surprises on you in the future. If your roof has any signs of damage, act now. Call Roofmaster for all your roofing needs in Ottawa. Our services include sloped roofing, flat roofing, RainPro eavestroughs, siding/fascia/soffit renovations, rooftop snow/ice removal, and specialty work. Request a free quote!